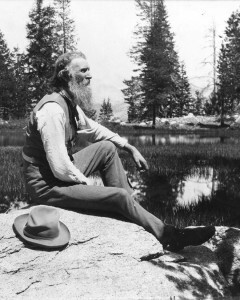 Muir was born in Scotland and immigrated to the United States in 1849. He embarked on a career as an inventor, but, after suffering an industrial accident in 1867, turned to the natural world. He wrote eloquently of the beauties of North America and of the vital importance of the wilderness, especially in modern life. He became a passionate advocate of forest conservation. A charismatic organizer, he was in large part responsible for the creation of California’s Sequoia and Yosemite national parks.